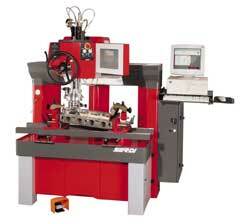 This machine has the most advanced technology for machining of valve seats and valve guides with the single cutter for any type of seat material with the best concentricity than any system can do. The most accurate system to generate any geometry on every seat materials with the high tolerance of concentricity and surfaces finish. It is working by interpolation between the cutting tool radius and spindle axis which allows it to make all type of profiles. The SERDI Profile offers you the possibility to ream valve guides, to machine valve seats, valve seat bores and inlet port. Perfect for Racing engines and engines prototyping and for valve seats of very large diameters.